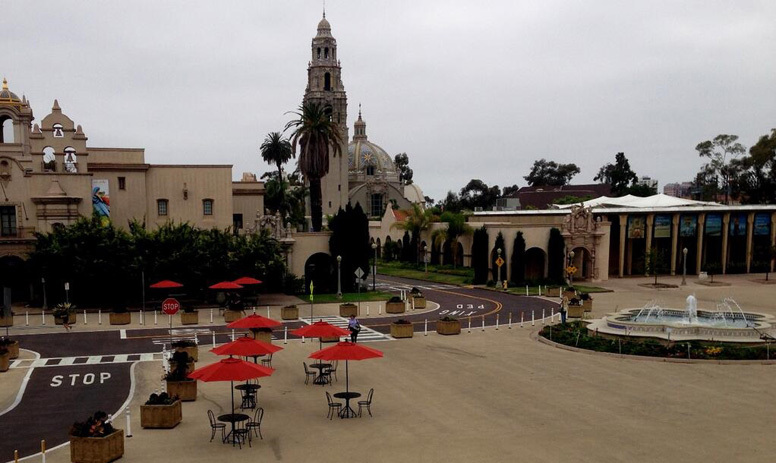 Mayor Kevin Faulconer and a group of major philanthropists are shelving a plan to remodel Balboa Park’s Plaza de Panama after bids for the project came in way over budget last month. A controversial plan to clear cars from Balboa Park’s central mesa is on hold. Philanthropist Irwin Jacobs, who has long championed the Plaza de Panama project, said this week that philanthropists have halted fundraising efforts necessary to get the project to the finish line after three construction bids each came in at least $20 million higher than earlier estimates for the project. “There is an excellent plan for how to proceed, but the costs are a little too high at this point,” Jacobs said. Mayor Kevin Faulconer and philanthropists had once hoped the Plaza de Panama project might break ground as soon as this spring. Now those plans, which had been contingent on philanthropists raising $30 million, have been dashed. “The success of the Plaza de Panama project has always depended upon the generous donations of the philanthropic community, and given the significant escalation in construction costs due to legal delays I respect the committee’s decision not to move forward at this time,” Faulconer said in a statement Tuesday. The mayor said he looked forward to continuing to look at other ways to invest in the park, such as reimagining the Palisades area. Jacobs said both the need for City Council approval for a larger construction contract and the array of other issues city officials must tackle, including a budget shortfall for the coming year, have further complicated the effort. Two years ago, a consultant hired by the so-called Plaza de Panama Committee projected construction would cost about $60 million. The city and other experts penciled in another $18 million in management and contingency costs, leading to a $78 million total estimate. Then two legal challenges stalled the project. By the time the city requested construction bids last fall, costs had risen dramatically. Construction bids released last month show the lowest bid came in almost 40 percent higher than the previous estimate – at least $83.5 million for construction alone. Other bids came in at $88.4 million and $105 million, totals the city has said don’t include some costlier options the city and the committee could pursue. A financing plan approved in November 2016 called for the city to handle $49 million in project costs. To cover its share, the city planned to seek bonds and then rely on paid parking in a planned grass-topped garage expected to replace the asphalt lot behind the Organ Pavilion to cover debt payments. The remaining amount – then estimated at about $30 million – was set to come from philanthropists. To move forward with the project, the city’s existing arrangement with the Plaza de Panama Committee suggests philanthropists would need to raise another $24 million – or make significant changes to the project or their contract with the city. Jacobs, who has previously looked at ways to cut costs, said it would be difficult to scale back envisioned utility improvements or upgrades to the park’s central plazas. “If you’re gonna do it, you should do it right,” Jacobs said. Further complicating matters, the 2016 agreement requires Faulconer to seek City Council approval for a construction contract that far exceeds earlier projections, a significant hurdle given outcry about other city needs amid budget belt-tightening. Jacobs noted that the project has been revived before following years of legal wrangling that led to the collapse of the initial 2012 arrangement between the city and philanthropists, and rejected the notion that it’s on life support. But he’s not expecting it to proceed anytime soon. Disclosure: Irwin Jacobs is a major donor to Voice of San Diego.